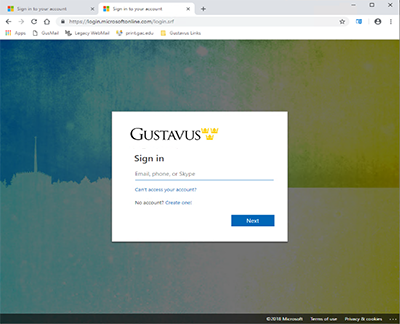 The login system used to authenticate Gustavus users to Microsoft Office 365 will be upgraded on Tuesday, October 9th. The new system offers several advantages over the previous system including increased reliability. This upgrade will be noticeable by a change to the layout of the page and the url in the address bar. Below is an example of the new layout. After the completion of the upgrade to the Office 365 login, this change will also be applied to other systems as well such as Code42 Crashplan. If you have any questions, please contact the Technology Helpline.